In WTT the scoring is no-ad. This means a game is won by the first team to win four points (1,2,3, game). When the game score is deuce (3-3) (game point), the receiving team chooses which side is to receive the serve. In the mixed doubles set the serve must be gender to gender at game point. A match consists of six no-ad sets and includes one set of men's and women's singles and doubles, and two sets of mixed doubles. Each no-ad set is won by the first team to reach six games. A nine-point tiebreaker will be played at five games all in any set. A nine-point tiebreaker will be played at five games all in any set. The person who is to serve next begins the tiebreaker. Each player serves two points in succession starting from the deuce court. Players change sides after four points. The first team (or person) to score five points wins the tiebreaker. If the tiebreaker reaches 4-4, the person who served the eighth point serves the ninth (final) point. The receiver, however, has the choice of sides (except in mixed doubles, where the service must be gender-to-gender). The winner of the ninth point is the winner of the set. Note: The tiebreaker can be won by one point. The tiebreaker counts as one game in overall match scoring. If the match enters into a Supertiebreaker, a coin toss will decide which team serves first/receives or chooses side in the Supertiebreaker. The Supertiebreaker should be treated as a new set and substitutions are allowed. Either player on the serving team may serve first. The receiving team selects from which end of the court they want to receive. In addition, court positions may be changed (i.e. the person who played fore hand position may switch with his/her partner to play the backhand position). Each player serves two points in succession starting from the deuce court. Players change sides after six points. The first team to score seven points wins the Supertiebreaker. If the Supertiebreaker reaches 6-6, the person who served the 12th point will serve the 13th (final) point. Since this set is mixed doubles, the final serve will be gender-to-gender. The winner of the 13th point wins the Supertiebreaker and the match. Note: The Supertiebreaker can be won by one point. The Supertiebreaker counts as one game in overall match scoring. Captains must submit starting line-up to opposing team captain before the start of each set. Each team captain has until the end of the five minute break between sets to submit starting line-up for the next set. The winner of the match will be determined by the total number of games won. However, for purposes of determining whether a match will go into Overtime, set number six will be the deciding factor. Note: Players cannot play in both mixed doubles sets. If the leading team won set number six, the match is over. If the trailing team won set number six, the match continues into Overtime until the leading team wins one game or until the score is tied. If a tie occurs, a Supertiebreaker will be played to determine the winner. If the overall score ends tied, a Supertiebreaker will be played to determine the winner. Overtime is a continuation of the sixth set. Team number six should be designated as the strongest mixed doubles team. Once you have come out of the mixed doubles set, you cannot return in Overtime. The first person to serve in Overtime is the person who was next to serve at the end of the sixth set. This Overtime rule gives the trailing team a chance to make a comeback. It also emphasizes the importance of the mixed doubles set. After every four games players change ends. In the nine-point tiebreaker, change ends only after the first four points. In the Supertiebreaker, change ends only after the first six points. The designated home team serves first in all doubles sets. The away team serves first in the singles sets. In the mixed doubles sets, the away team serves first in the fifth set, the home team serves first in the sixth set. Since the serving order is predetermined, the receiving team selects from which end of the court they want to receive. When a serve hits the net and bounces within the service court, the ball is playable. In doubles, either player on the receiving side may return the ball after it bounces. If any player on the court calls “let”, their team loses the point. If players on both teams call “let” then the point will be replayed. Coaching is allowed throughout the match as long as it does not interfere with continuous play. Coaching is not allowed between first and second serves as the second serve must be struck without delay. Only one member of the team is permitted to go out on the court to coach and the coaching must be completed within the twenty (20) second time limit allotted between points. We encourage team members to stand along the court and support their team. Coaches and non-participating players must remain in a designated “player’s bench” area until the completion of each point. 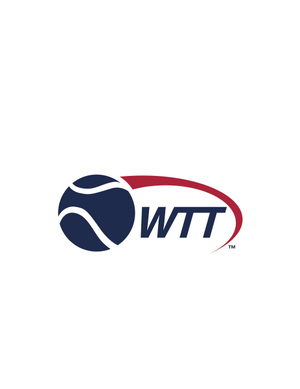 WTT Staff will determine the “player’s bench” area for the facility/courts. Only the players on court can make the line calls. Team members along or near the court cannot make line calls or call footfaults. A team can at any point, INCLUDING THE SUPERTIEBREAKER, substitute a player (same gender) into a set for any reason. Once a player is replaced, he/she cannot return in that set and players cannot play in both mixed doubles. If a substitution occurs in doubles, the remaining player cannot change the side on which he/she receives or the service order. Substitutions are allowed in Overtime if a player has not already played in mixed doubles. The Supertiebreaker should be treated as a new set, and all substitutions are allowed. In WTT you warm up with your teammates. All players are allowed a ten minute warm-up. All team members are encouraged to warm-up during this time. Once play has begun, a five minute warm-up is allowed between sets. This must be adhered to so that all sets will be completed in the time allotted. If the home or away team player does not show up on time for his/her match, there will be a 15 minute default time should a substitute player not be available. If a set is defaulted, the score should be recorded as 6-0 in favor of the players present. The default rule will not apply when the missing player is on court playing a previous match. If the home or away team does not show up on time for the match, there will be a 15 minute default time. If a match is defaulted, the match score should be recorded as 36-0 in favor of the team present. If a player retires during a set and cannot be substituted, the score will be recorded with the games played standing with the opposing team receiving six games.